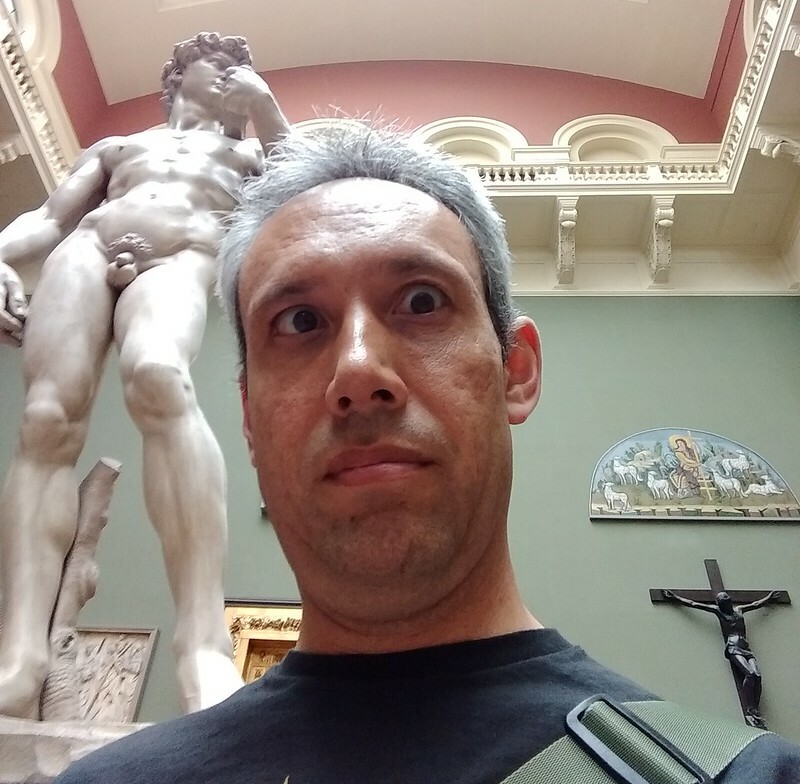 Before we headed back to Australia, one more day in London to explore… at least for most of us. Three of us were catching an evening flight, but M had to head back 12 hours earlier, departing on a morning flight. I walked her to the station and helped her (and her luggage) get on the right train to the airport. For the rest of us, we packed up all our stuff from the Air BNB flat. Just our cases were left, by arrangement with our host to pick them up later. So, how to spend the last day? So instead, using Google Maps as a guide (again!) we caught a bus east to Shepherd’s Bush. 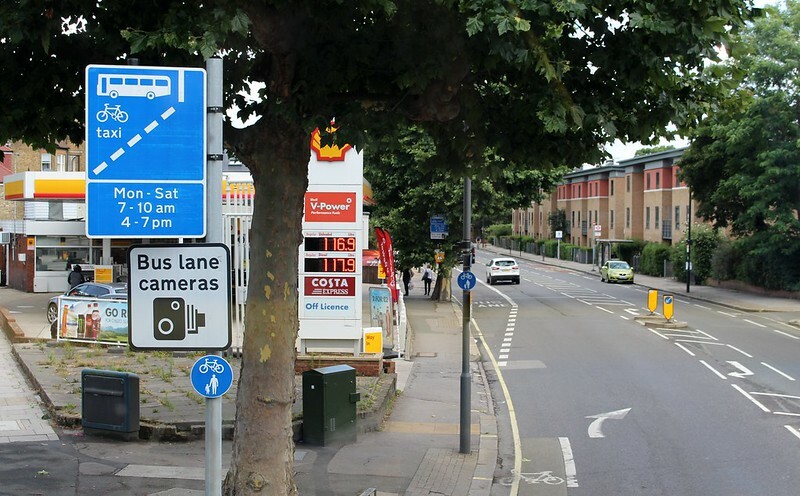 Notably, the bus lanes were plentiful (and enforced by cameras), and automated signs inside the bus advised passengers of the District Line disruption. 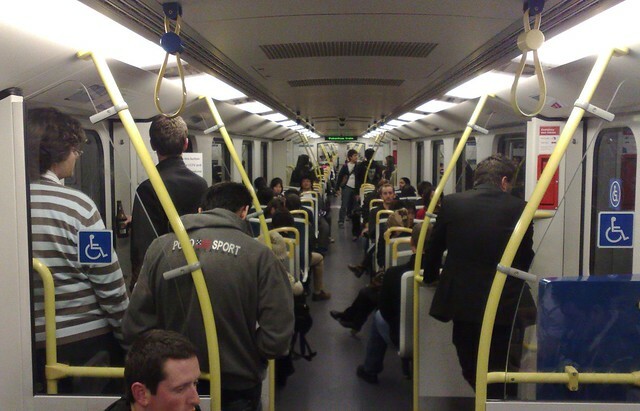 Ever seen that on a bus or tram in Melbourne? Also note the price of petrol: £1.17, which is about A$2 per litre. 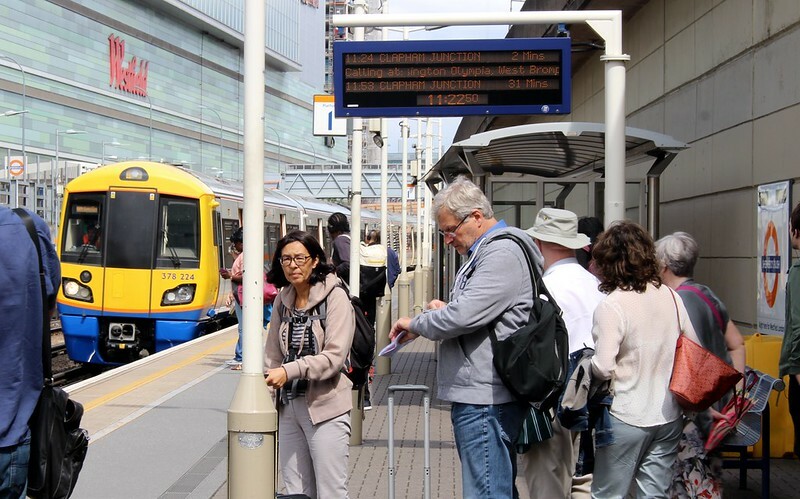 From Shepherd’s Bush we changed to a train – one of the London Overground routes. The Overground is set of suburban lines gradually transitioning into a metro-like service — in a similar way to Melbourne’s suburban train lines transitioning to a metro. In fact, the Overground operator from 2007 to 2016 was a joint venture with Hong Kong’s MTR, the operator of Melbourne’s suburban trains. 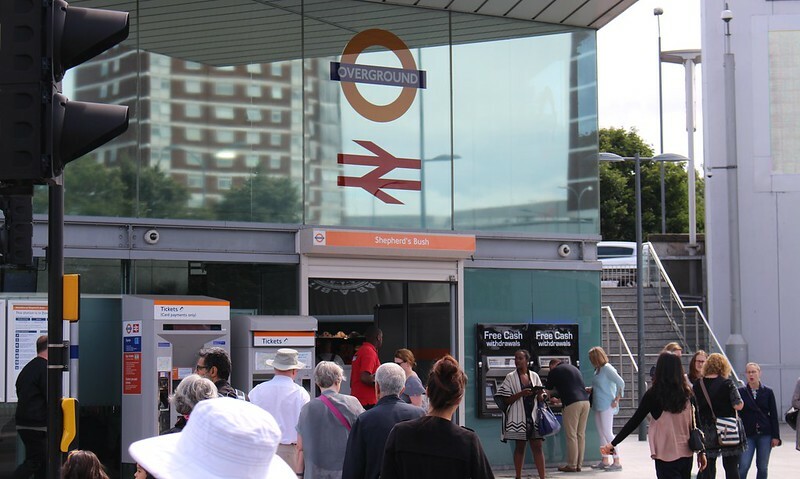 Overground has branding similar to the Underground, and is moving to more frequent trains, mostly now every 15 minutes. 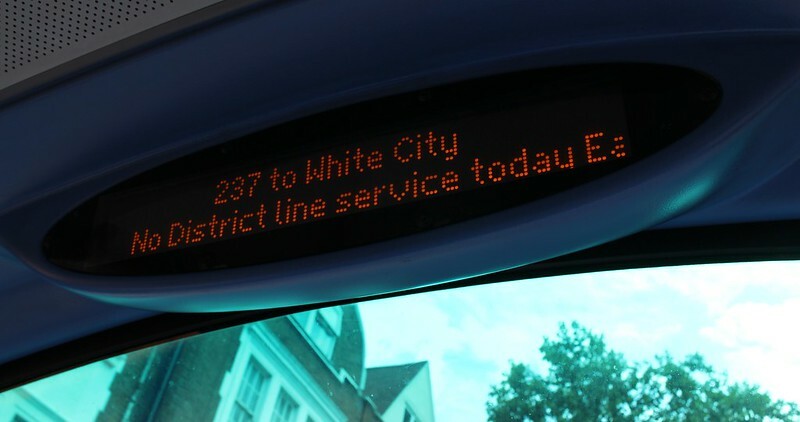 The lines form a set of mostly orbital services around much of London – a couple of the services go into the central city terminus stations, but they’re not the main emphasis of the network. Note the adjacent Westfield shopping centre. 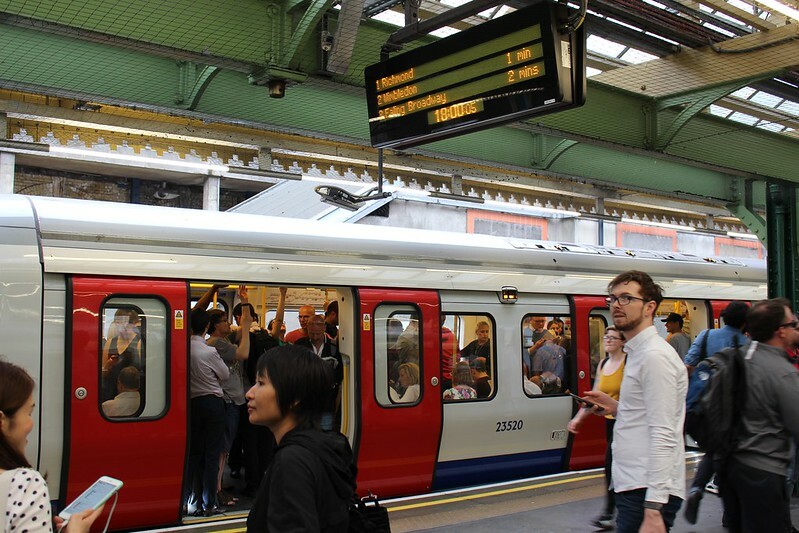 The pace of the Overground train seemed slower than the Underground – this was part of what prompted my blog post about the disadvantages of sticking strictly to a timetable. That train took us to Clapham Junction, memorable to me for being in an old Guinness Book of Records for being the busiest station in Britain — in fact it’s now said to be the busiest station in Europe by number of trains passing through it; up to 180 per hour. From there we caught an express train to East Croydon. Many suburban trips in London are actually served by long distance trains; this one was heading to the south coast somewhere, and had first class accommodation (within the carriages, not in separate carriages) and toilets aboard. 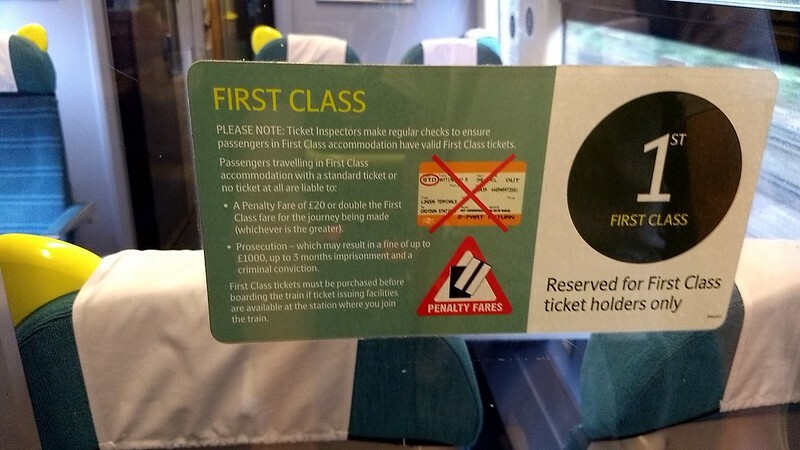 The conductor came through and checked tickets – some passengers were travelling on those orange National Rail tickets you see everywhere around Britain, some like us on Oyster and credit cards – for which he had a reader. Also notable on that train was emergency information above the doorways, including the advice to stay on the train unless advised… but if you needed to evacuate, detailed instructions for doing so. I wonder how often it happens. It was pouring down with rain when we got to East Croydon station. 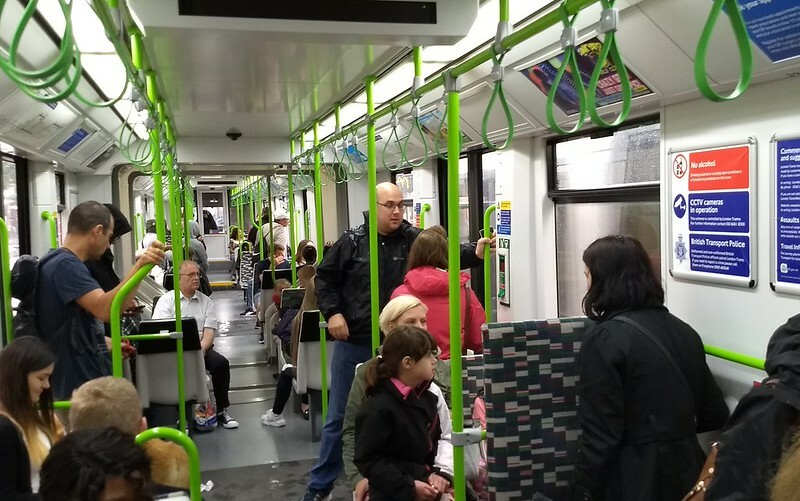 We exited the station and hopped on a Tramlink ummm… tram — it was so quick I didn’t even snap a photo of the outside of the tram, but here’s one of the interior: note the step; the design is mostly low-floor, but not 100% low-floor. I suspect this has cost and other benefits, at the expense of not being entirely accessible. We caught the tram just one stop to North End, where the main shopping area is located. We found some lunch nearby in some coffee/sandwich shop, which was cheap and quick, though a bit crappy. No matter, we decided to head back into Central London. West Croydon station was slightly closer, even if the trains were less frequent and slower, and at least it had stopped raining. 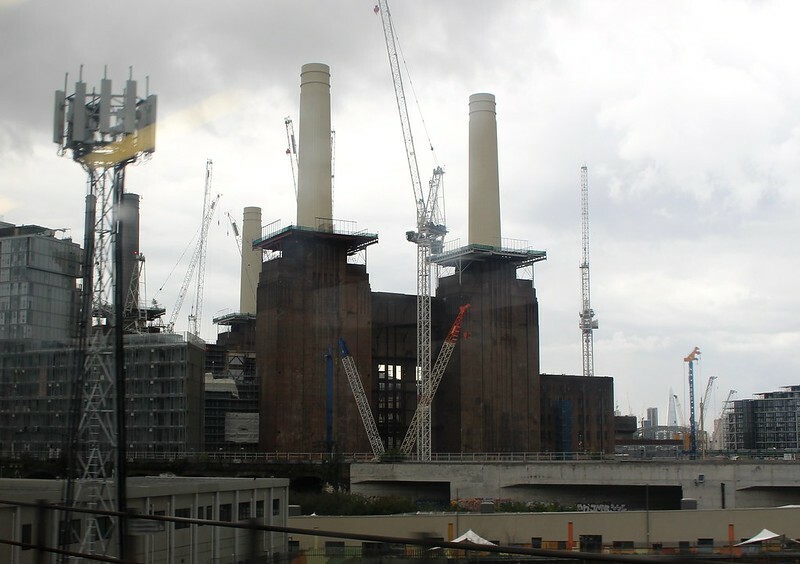 The suburban train took us back through Clapham Junction, past the remains of Battersea Power Station – I remember when it was a huge and imposing monolith; now they seem to be only leaving the facade as they redevelop the area. 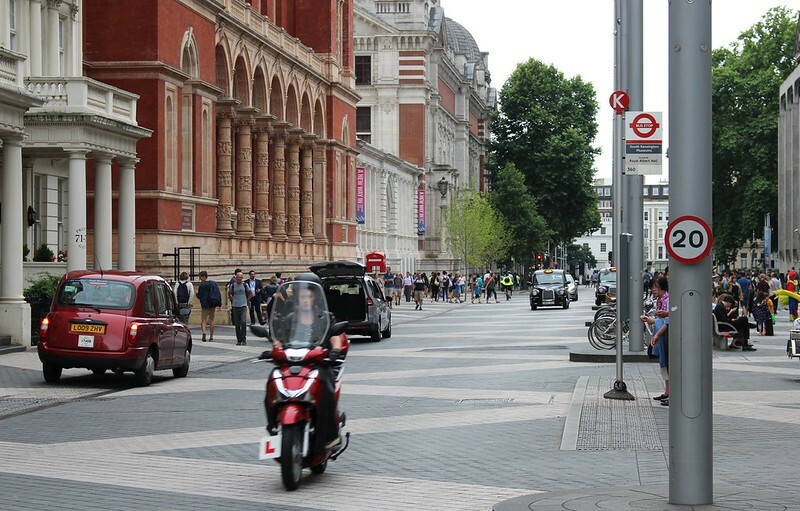 We arrived into Victoria Station, and had planned to catch a Tube up towards Oxford Street, one of central London’s main shopping streets. No go. As you sometimes see on those Tube documentaries I’m so fond of, they’d closed the entrance to Victoria Underground Station. 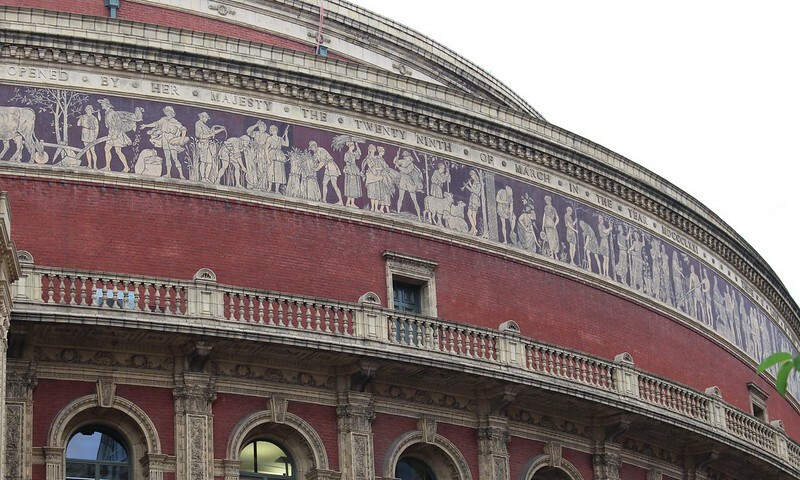 It wasn’t obvious why – but the queues to get in made the impact obvious. 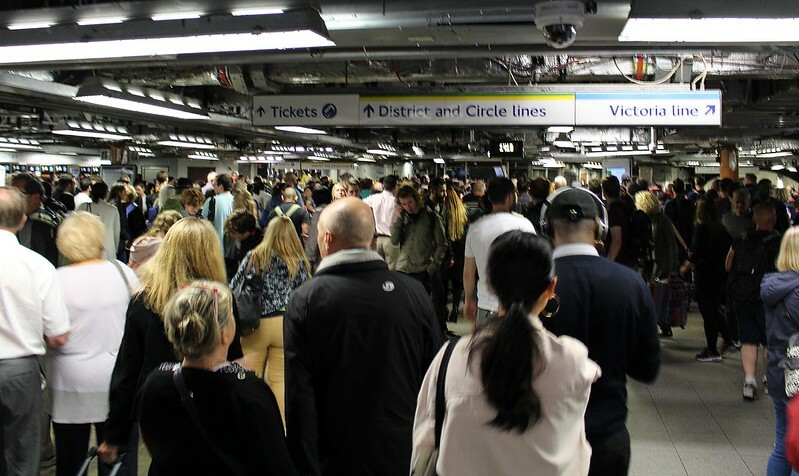 When it eventually re-opened, there’d be severe crowding while the backlog of people cleared. Bus seemed like a better option in the circumstances, and might well get us closer to where we wanted to be, as we had a couple of specific shops in mind. As I’d learnt the day before, to the outsider, the central London bus network is confusing mess of spaghetti. Google Maps saved the day yet again, telling us which route to catch, and the frequent service meant only a couple of minutes’ waiting. In fact, for all our roaming around on this day, we didn’t wait more than five minutes at any one point. As they say in public transport advocacy circles, Frequency Is Freedom. The rain was really coming down now. It was the first really bad weather on the entire holiday – must be a sign that you should go home. 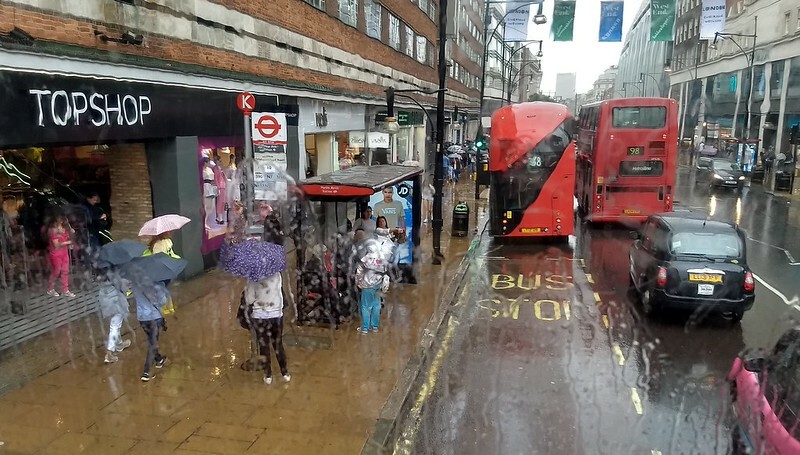 We hopped off the bus in Oxford Street – J wanted to look in the Doc Martens store. After that we continued exploring and walking, but at one point took shelter in a John Lewis department store, which allowed us to re-fuel with a cup of tea and a muffin, and use the facilities. The rain had slowed to a drizzle, so we continued on, passing one of the Crossrail construction sites. It’s a huge project, and the new stations are expected to start opening in 2018. 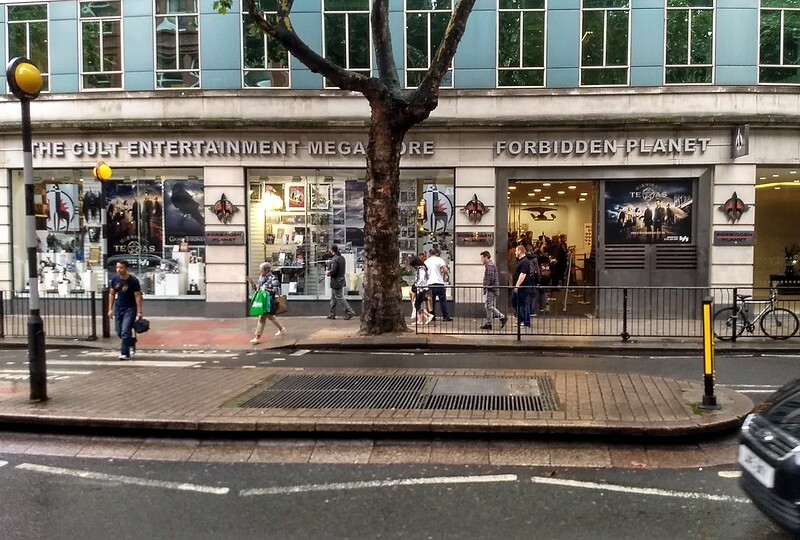 And so to our ultimate goal: the Forbidden Planet London Megastore. I bought myself this: Space Helmet For A Cow: The Mad, True Story of Doctor Who (1963-1989). A very amusingly-written history of the TV show, which I started reading on the way home. Highly recommended for fans of the show; I’ve subsequently been given volume 2 for my birthday, and am enjoying that too. 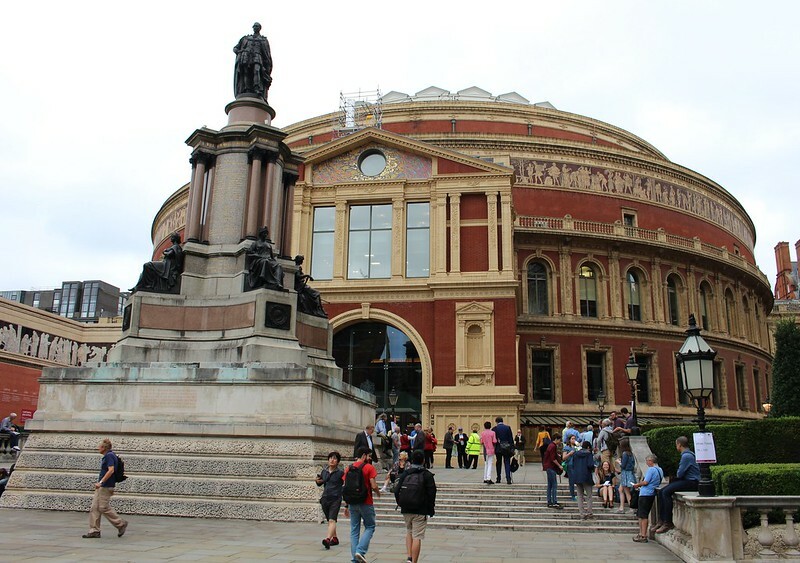 From there, we headed to Covent Garden, where we’d visited on our first (proper) day in London. 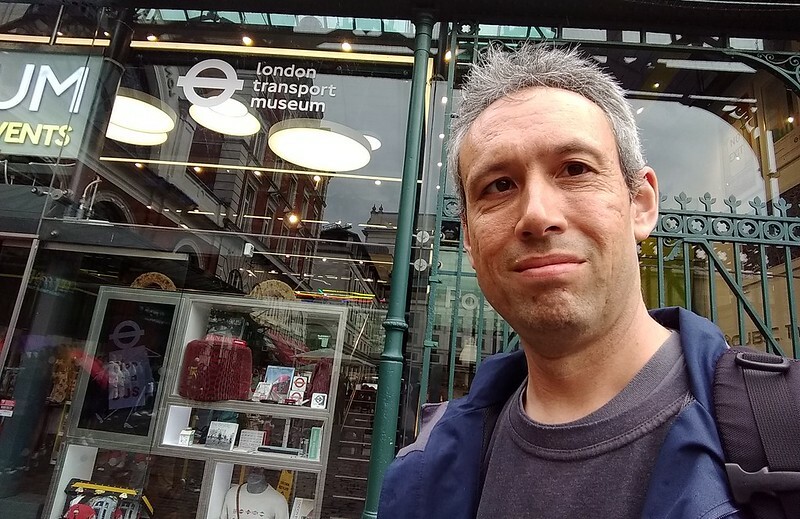 J found another Doc Martens store (he was looking for a specific design) while I ducked back into the London Transport Museum to buy that District Line cushion I’d been coveting. 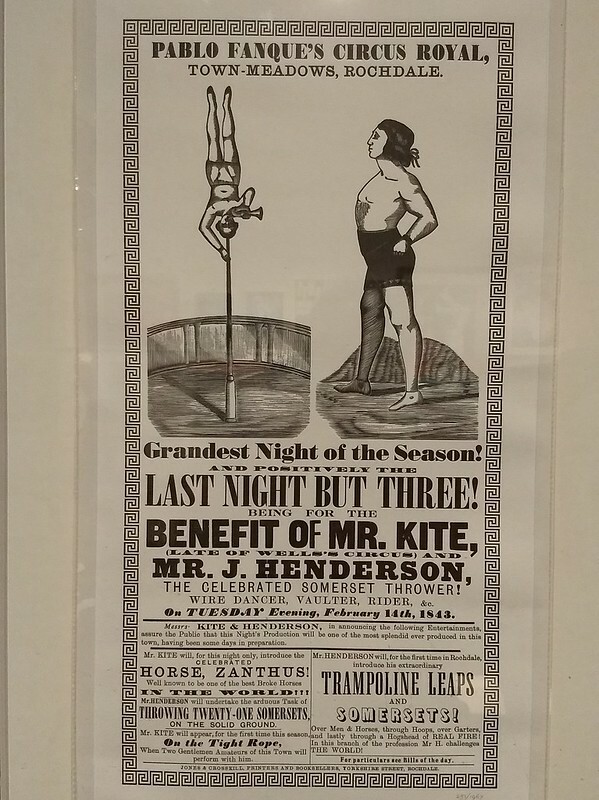 It was expensive (£45), but it was unlikely I’d be back anytime soon to be able to buy it. FOMO. 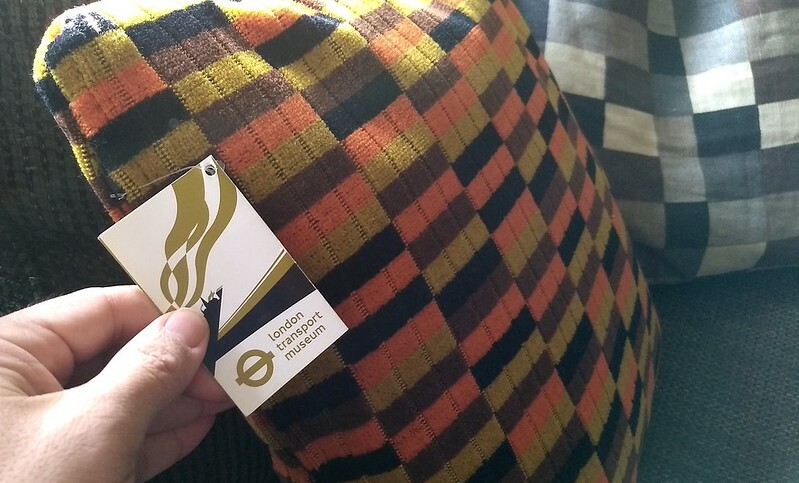 It appears to be genuine moquette, so it’ll probably outlast the couch and everything else in the house. 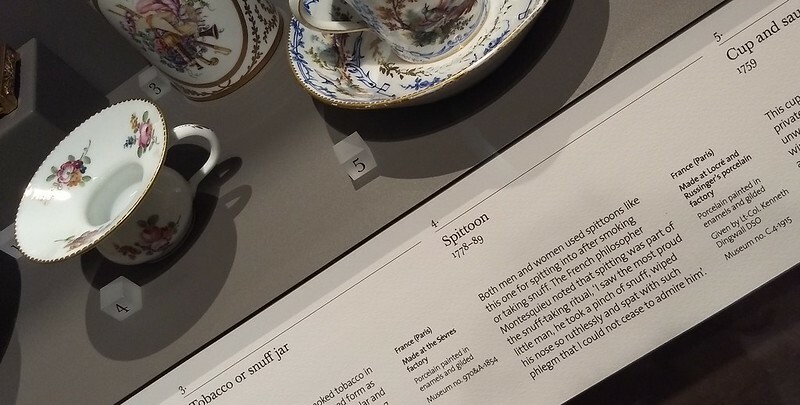 There was also a book in the Museum shop that I’d noticed, but it was bulky and heavy and also expensive, so I’d ended up ordering that online. It arrived back at home a couple of weeks later: British Rail Designed 1948-1997. I’m so far finding it a good read if you’re interested in design and railways. But there were lots of other goodies. Honestly, if I didn’t have my head together, I could do an awful lot of damage to my credit card in there. 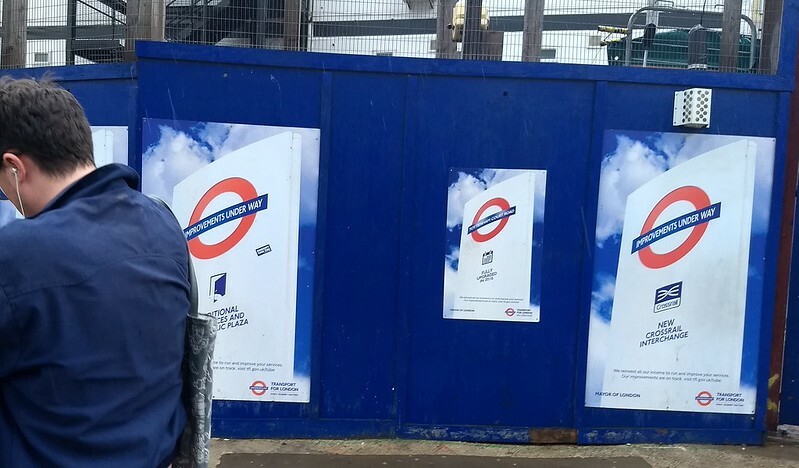 It was 5pm, so we hopped back on the Piccadilly Line to head back to Chiswick/Turnham Green. Back to the flat, and we picked up our bags and headed to the airport, which was quick and easy on the Tube — despite the warning notice at the station of delays, which I only noticed later was dated a month before. Hmmm… maybe it was relevant but they just hadn’t fully updated it. Many of the Underground trains into Heathrow do a loop; terminal 4 first, then terminal 2/3, then back to Central London. We needed T3, and after checking in our bags, we found some food for dinner, and checked emails. 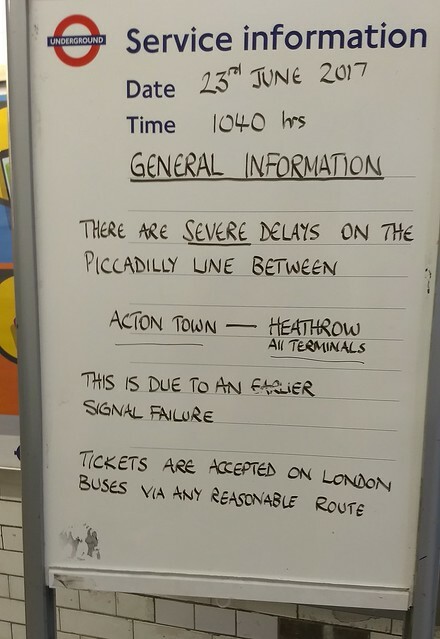 Among the emails, I found one just in from a contact at London Underground. Alas, I hadn’t thought to email him about being in town until after I’d arrived. He’d replied that he’d love to arrange to meet up and organise a look around behind the scenes. Too late! Damn. When can I come back??? Oh well. We still had a bit of time to kill before the flight. J looked for a place to charge his phone; I took my remaining UK currency to buy some chocolates to eat on the plane. The plane took off on time, and we headed towards Singapore. Good morning! 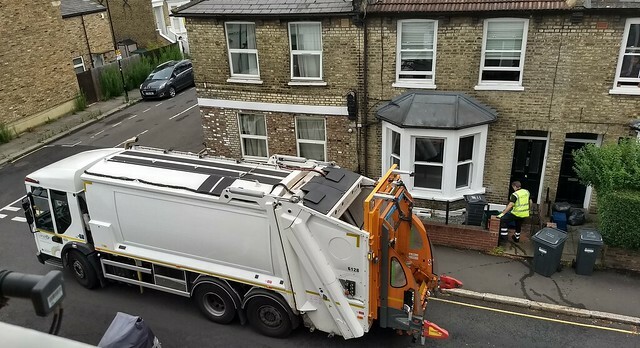 It was garbage day in our street in Chiswick. As usual, you notice the little things that are different from home. In the London Borough of Hounslow, the garbos (what’s the local term? Not sure) don’t have an arm on the truck that grabs the bins; they have to manually put the wheelie bins into place. On this occasion, we could hear raised voices – one of the neighbours was arguing with the garbos about what they should take. With three and a bit days left of the holiday, we were feverishly trying to work out what to see, and when to meet up with friends. For today, it’d be Greenwich. 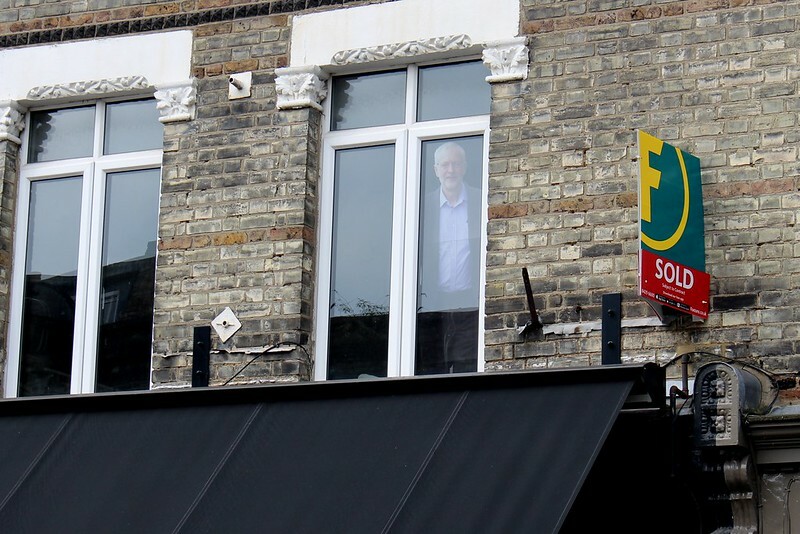 On the walk to the station, we did spot Jeremy Corbyn, creepily standing in an upstairs window. I’m sorry to harp on about this, but one of the joys of a network of frequent public transport services is that you can get from anywhere to anywhere without the hassle of long waits when you change. The various routes mean the whole city is easily accessible. This is something London does really well. 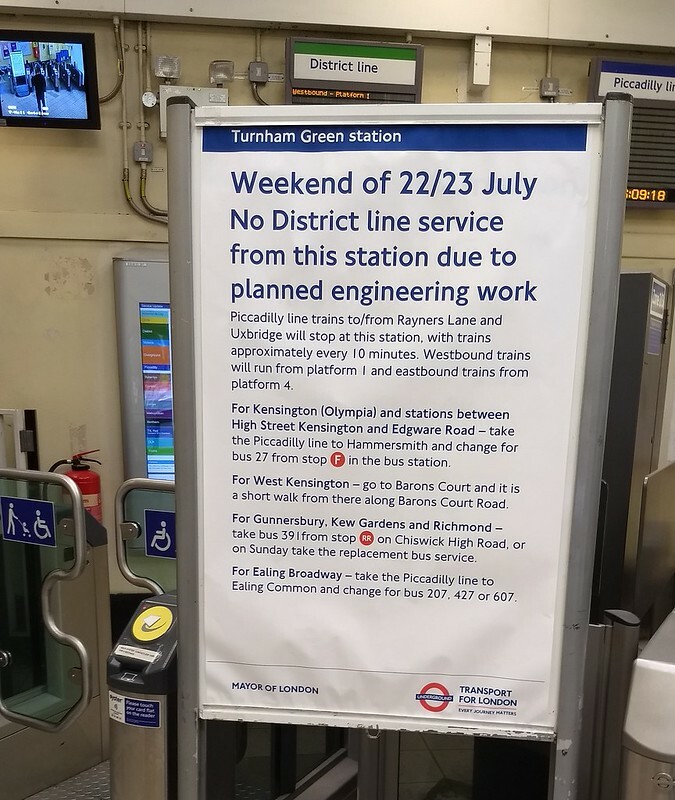 So we caught three trains: walk to Turnham Green station / District Line to Westminster / Jubilee Line to Canary Wharf / Docklands Light Railway to Greenwich… with barely a wait between them. Turns out the connection at Canary Wharf to the Docklands Light Railway is a few minutes’ walk; something that is in fact indicated on the Tube map. One thing that did nearly catch us out is that the DLR stations don’t have fare gates, and we didn’t notice the Oyster readers on poles when we initially entered the station. It probably fits in with their automated trains that they wouldn’t have gates and staff at most stations. A train was just coming, and we dashed back down to touch-on. 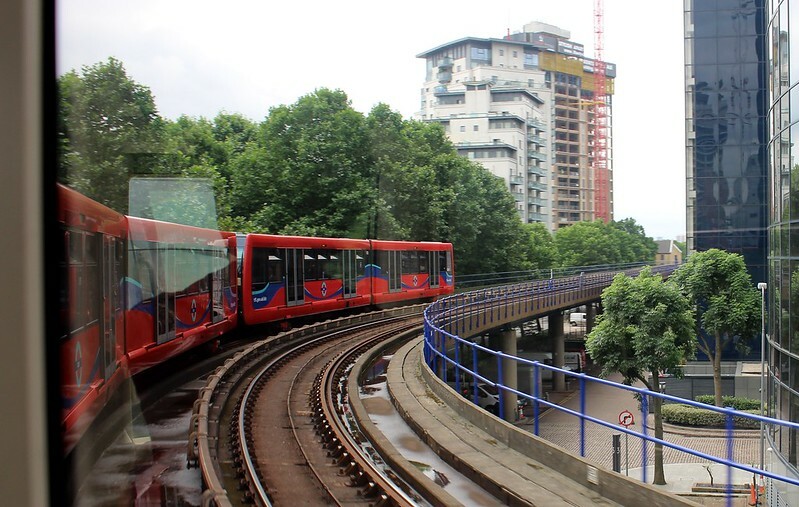 An alternative route would have taken us via Tower Hill to connect directly from the District Line to the DLR, though Google Maps suggests another route entirely, via Cannon Street and a suburban train. 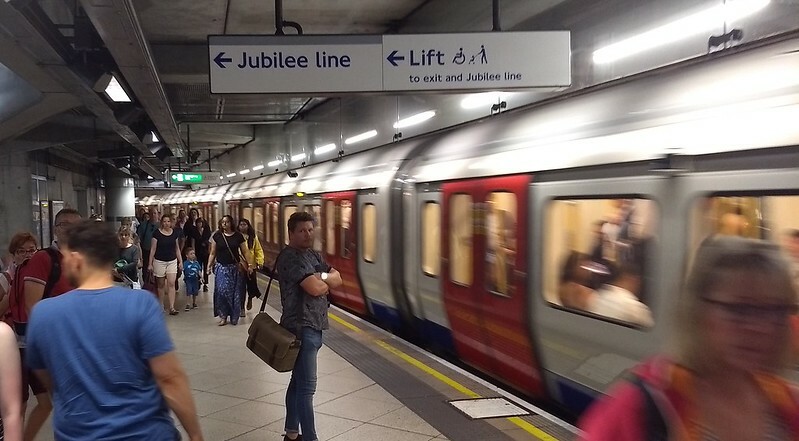 But I was interested to check out the newer part of the Jubilee Line, as well as the Canary Wharf underground station used in Star Wars Rogue One. 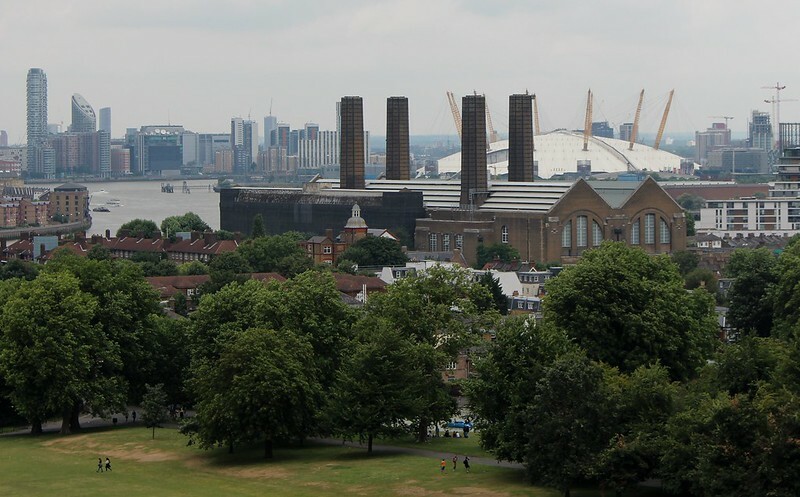 We walked through Greenwich up the hill to the Royal Observatory, admiring the view back down the hill along the way. 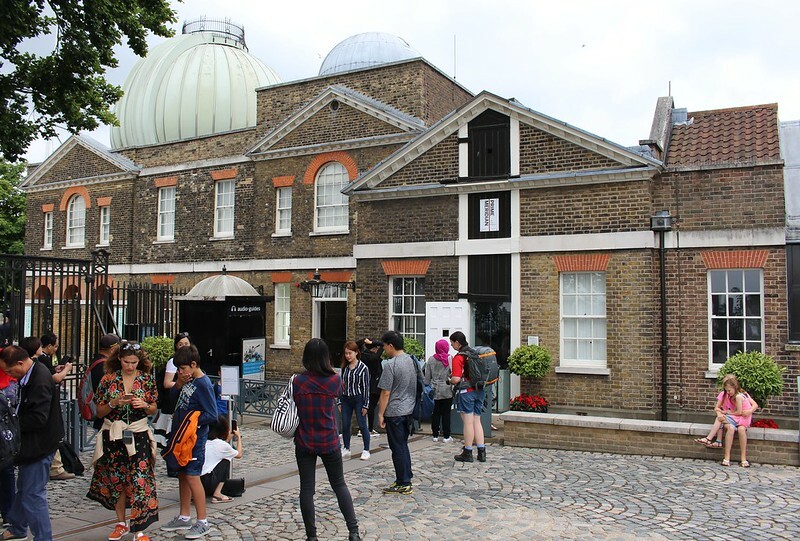 The Observatory museum is very interesting, with some good stuff on the history of fields such as navigation and astronomy, and clocks, watches and timekeeping. 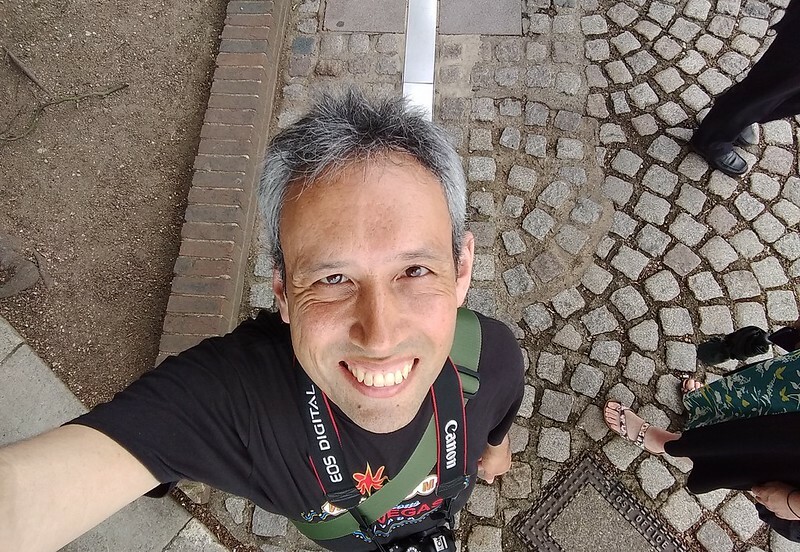 It also of course has the Prime Meridian going right through the courtyard, so you can stand in the eastern and western hemispheres at the same time. With an English mother and an Australian Born Chinese father, I guess I am an East Meets West kind of person. 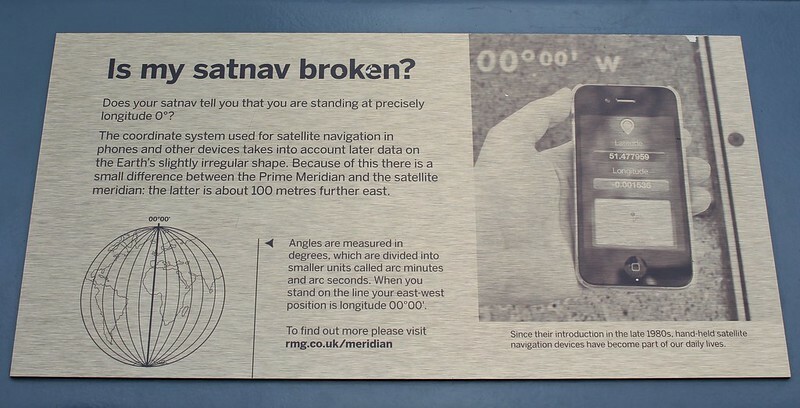 A note in the courtyard mentions that the “satellite meridian” is 100 metres east of the Prime Meridian, so phone GPS might report a slightly different location. Hmm okay. By 1pm we were ready to move on, but decided to wait for the Time Ball. 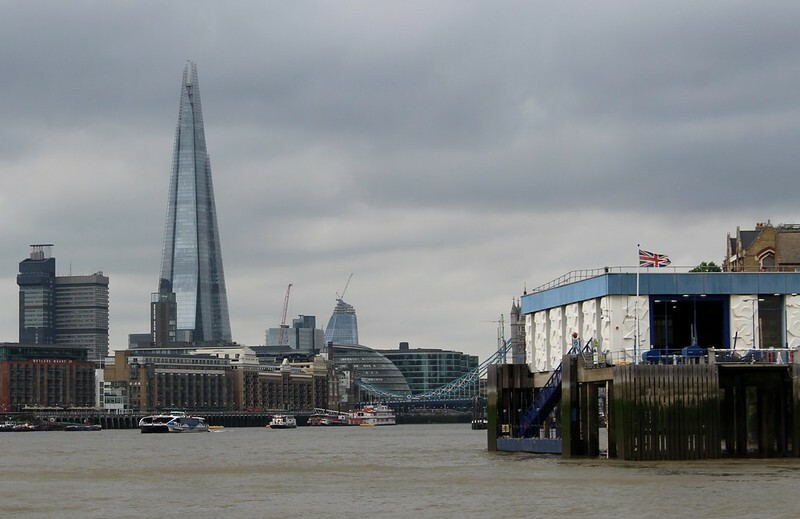 At 12:55 it rises, then at 1pm it drops again, to mark the hour, visible to ships on the Thames in a similar way to the Flagstaff in Melbourne. 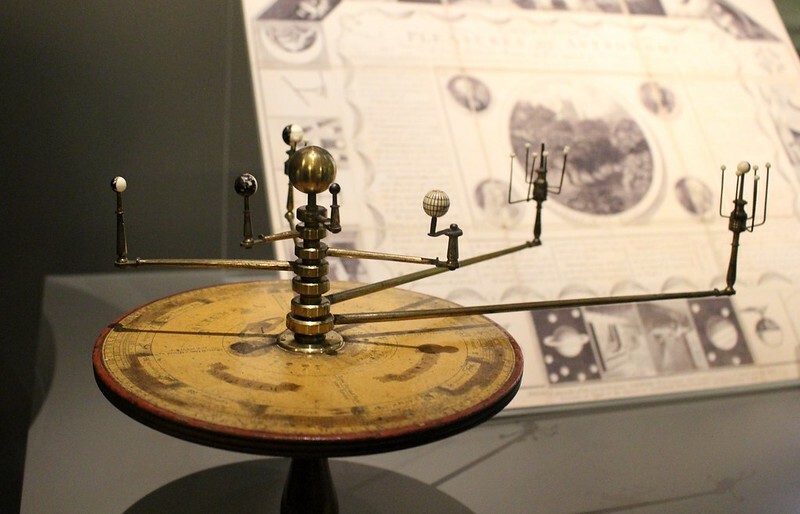 The Time Ball has been in use since 1833. Today, it rose all right, but then failed to drop back down. By a few minutes after 1pm, we were wondering what had happened. I heard a staff member quietly mention to somebody that clearly it was broken. Oh dear. 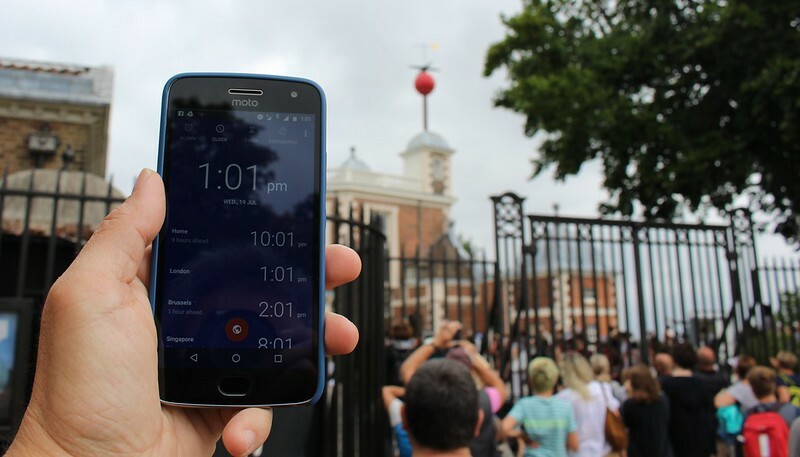 At present, it’s still not working: the web site says: Please note: unfortunately the the Time Ball is currently not in operation, awaiting repairs due to damage from recent weather conditions. We headed down the hill to the Maritime Museum, and had lunch there, though we opted not to look in the museum itself. Instead we walked back past the Cutty Sark (kind of London’s Polly Woodside, and a similar vintage) to the mighty River Thames and queued for the Thames Clipper river boat. 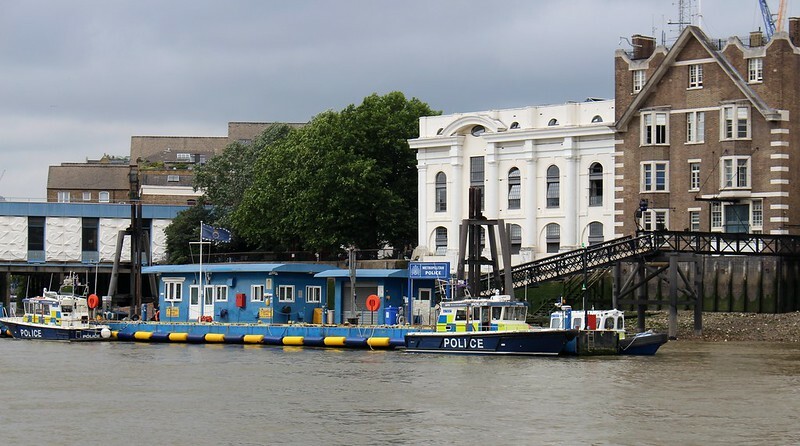 The boats run roughly every 20 minutes, and accept use Oyster for payment just like the buses and Tube. 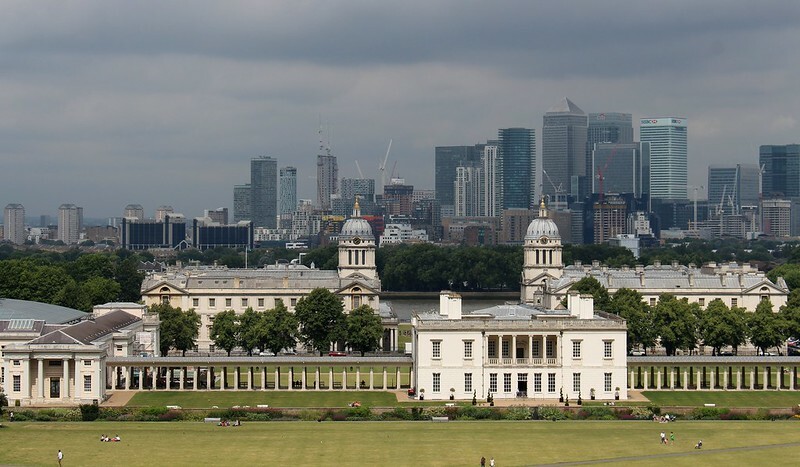 The fares are more expensive than other modes, but there’s a big discount if using Oyster (or contactless credit cards): for Greenwich to central London it’s £6.50 instead of £8.70 paying cash. 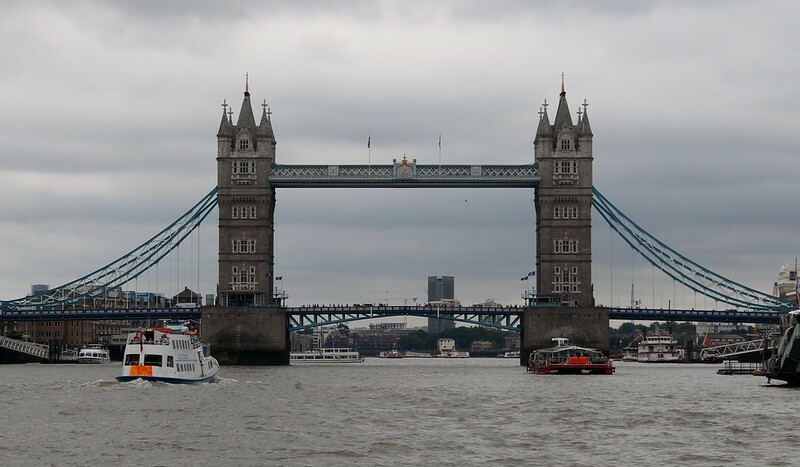 The boat headed west along the river, stopping at various wharves along the way, then under Tower Bridge. We hopped off an Embankment and caught a Tube to South Kensington. Here’s a line map from the train, showing the eastern end of the District Line. 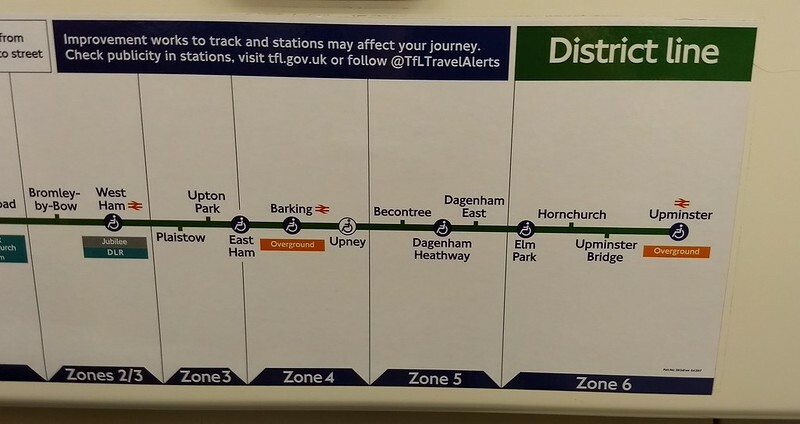 An memorable line in the old sitcom Drop The Dead Donkey had Henry referring to someone as being “completely Dagenham East!” That’s four stops past Barking. 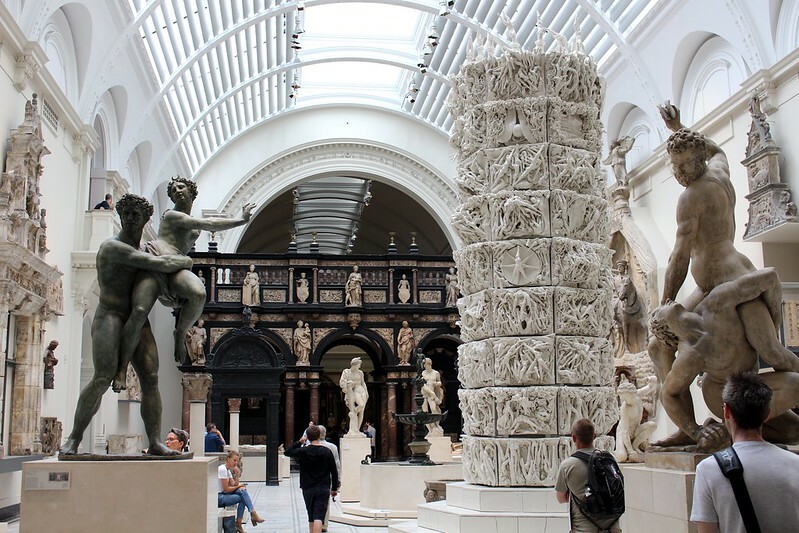 We started off in the V&A – it’s a delicious mix of design and art – and had a good look around there. I&J decided to head off to the other museums, while M went off to look at the V&A’s Balenciaga exhibit. 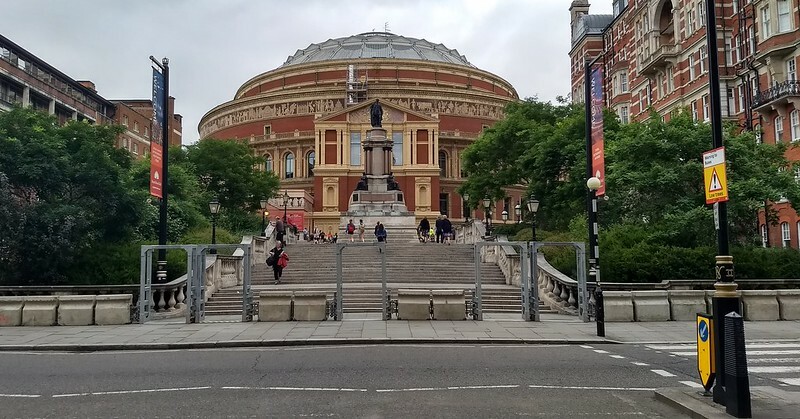 I decided to look around elsewhere around the V&A, then I diverted out to have a quick look at the Royal Albert Hall – we’d tried but failed to secure tickets to a concert of John Williams music at the Proms, which were on that week. The streets were busy, and I noticed ugly, sometimes poorly-placed bollards around the place. Hey, it’s not just a Melbourne thing! 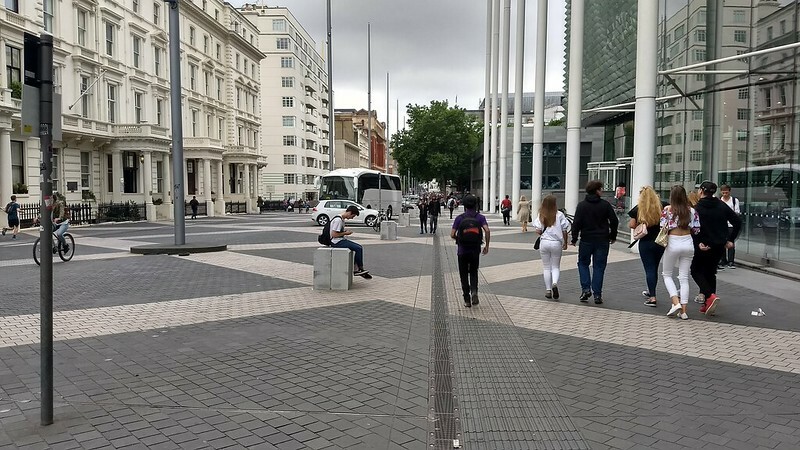 On the bright side, there was some interesting street design, blended with the pedestrian area I guess as a form of traffic calming. I ducked into the Science Museum for a nose around there. 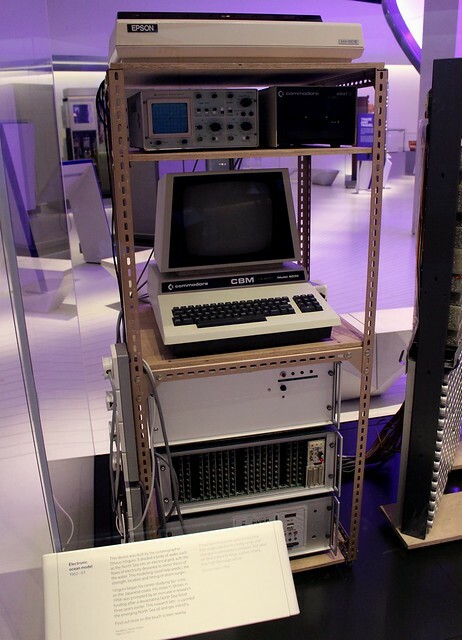 I hadn’t been in there before, and there was some good stuff for geeks people into technology and engineering. 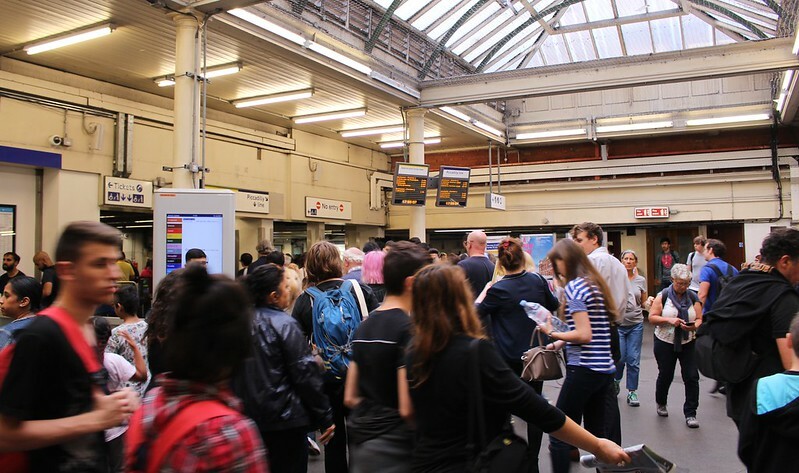 We all met up again at South Kensington station, where peak hour was in full swing. Packed train — as the screens told us, there were plenty just a minute or two behind, so we could wait for the next one… but we needed to catch the correct branch anyway — we needed Richmond or Ealing Broadway. Back to the flat for a pause. 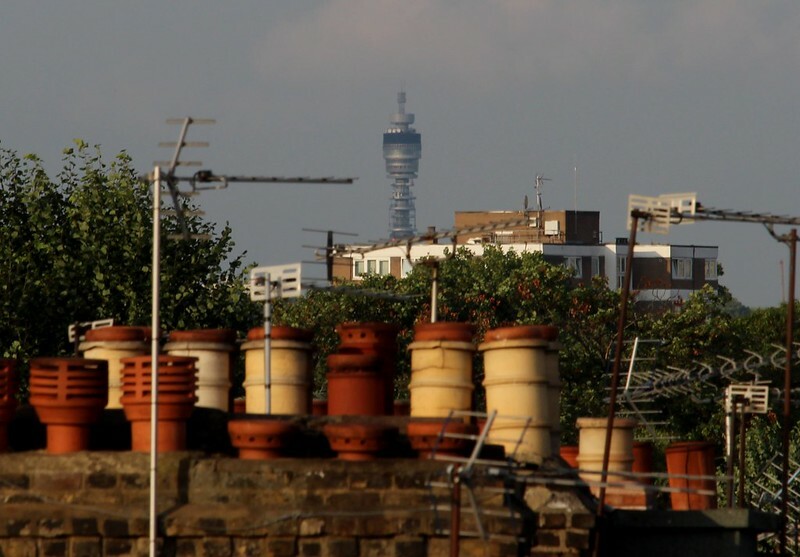 I decided to peek out of the top roof windows to see what I could see. 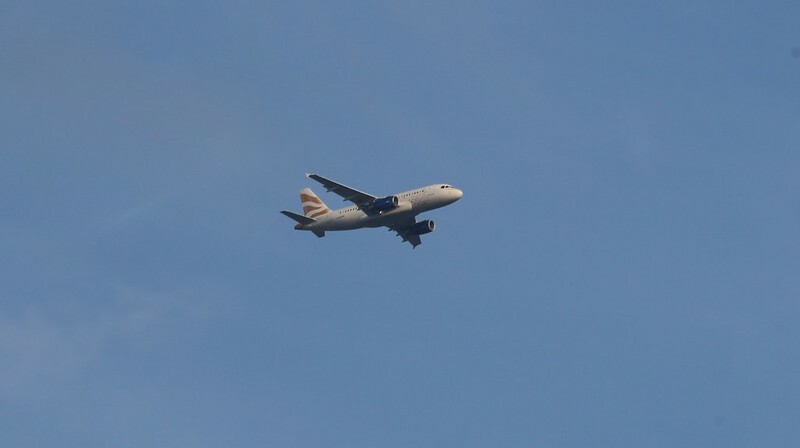 With the telephoto lens, I could easily spot the Post Office Tower (now known as the BT Tower; no giant kittens in sight), the Shard, and planes heading into Heathrow Airport. 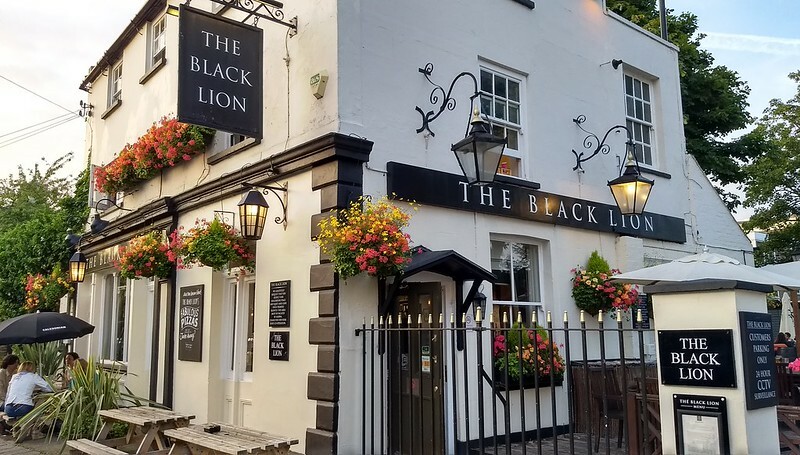 Taking the advice of our host, we walked south to the river and then east along it, admiring the expensive houses, to eventually find the Black Lion pub for dinner. 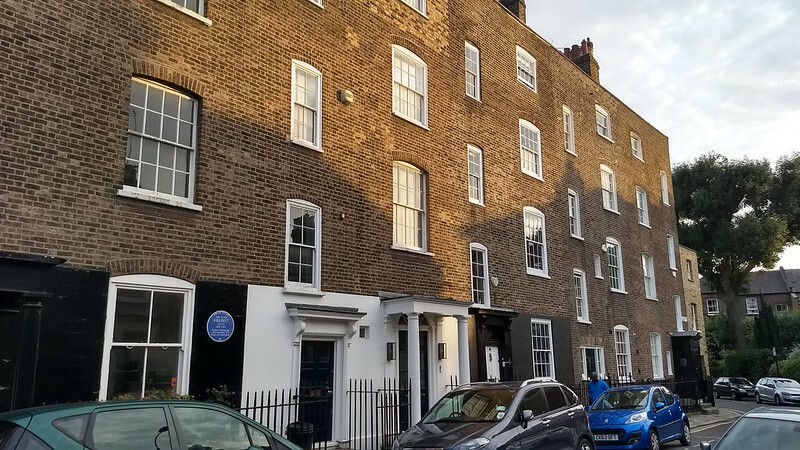 We walked back a different way, passing another pub, where we noted in the front garden was ex-Top Gear host James May, cheerfully chatting to another patron. Back along the high street (generic term in Britain for the main street through a suburb, though in this case actually called Chiswick High Road). It was just getting dark, but it was still warm. Given that, we stopped off at a place called Oddono’s for an ice-cream before heading back and planning tomorrow’s exploration. 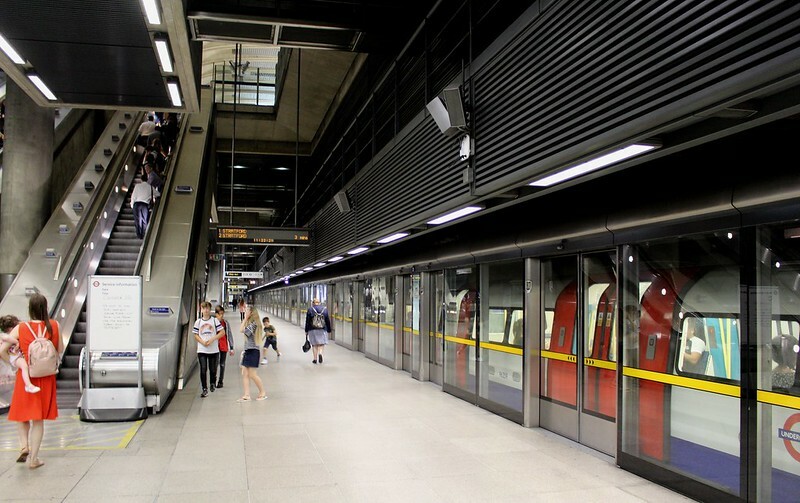 News from London is that they are planning 24-hour Tube services on five lines from 2015 at weekends. It’s tied to a grand plan which will also see staff taken out of ticket offices (in favour of helping customers more directly, for instance with ticket machines), more Wifi on stations, and contactless bank card (eg Paypass) payments. All interesting, but let’s focus on the all-night trains. Running all-night services on weekends only is an interesting balance between meeting big city passenger demand, helping late-night economic growth, and still allowing time for maintenance — which can still happen on weeknights. Could we do it in Melbourne? Would we do it in Melbourne? 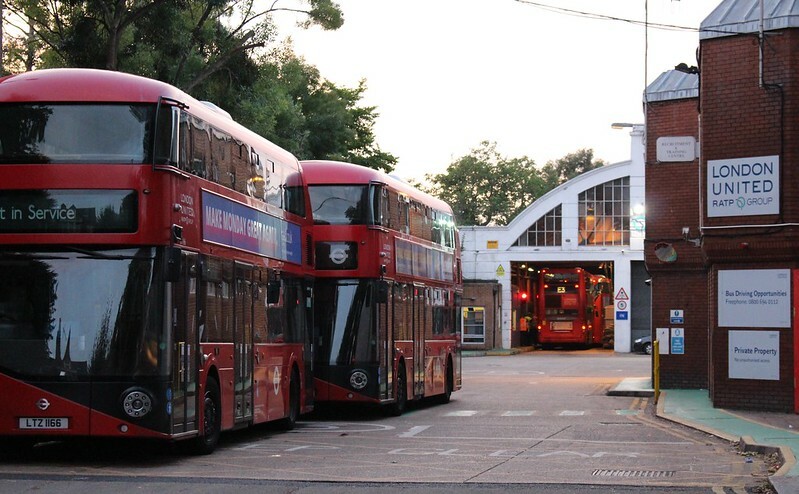 Nightrider buses might well be adequate for demand on weeknights (but don’t even run at present), but on weekends (Friday and Saturday nights) are frequently swamped with users. Particularly on the busiest lines, and particularly over summer, trains would cope better with the loads. Here’s the interesting thing: early planning for all-night weekend trains appears to be already be under way. One obvious step is ensuring that any future development on the rail network doesn’t get in the way of it. The planning for Southland station includes such a clause. 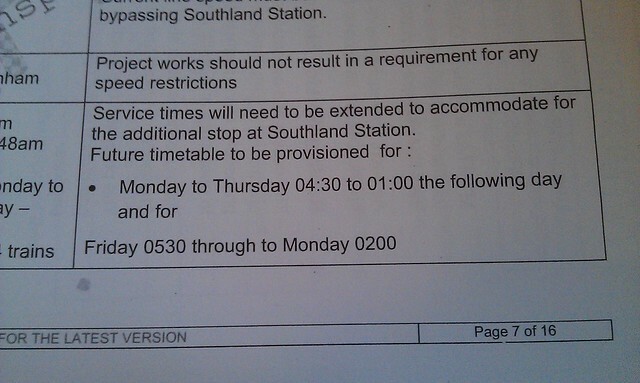 In a document obtained via FOI by The Age, the requirements clearly state that the infrastructure should allow for a future timetable with trains running 4:30am to 1am on weekdays, and “Friday 0530 through to Monday 0200” — in other words, continuous services from Friday morning through to late Sunday night. It doesn’t mean 24-hour weekend trains will be starting any time soon, nor that they would necessarily run on every line — a more likely initial outcome is the busiest lines only, where Nightriders don’t cope. But it does appear that the early planning for it is happening now within PTV — ensuring that no new initiatives get in the way of doing it in the future. Great to see it’s on their radar. Want to see it happen? Then get busy making your voice heard in the media and with your local MP. 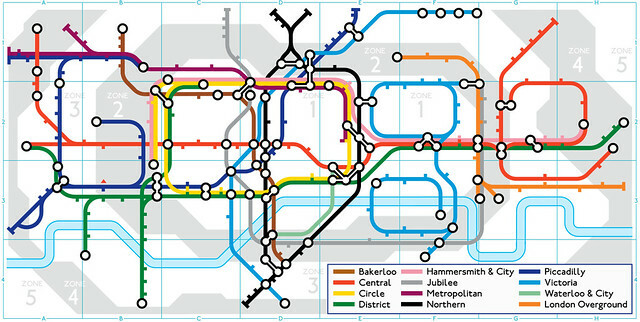 Google celebrates 150 years of London Underground – and could we have bought Oyster? As seen at google.co.uk on Wednesday. Very cool. 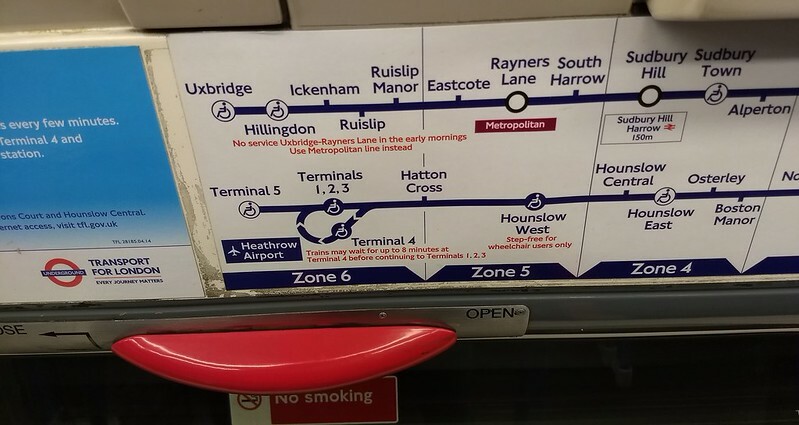 Note the subtle shading of fare zones, which reflects how they look on the official maps. It’s been claimed in the past that in Melbourne we couldn’t adopt an existing smartcard ticket system like Oyster because Melbourne had specific needs. I disagree… London has zones, trains, trams, buses and ferries. We have zones, trains, trams, buses. A handful of ferries run in Melbourne, but aren’t part of the integrated fare system. 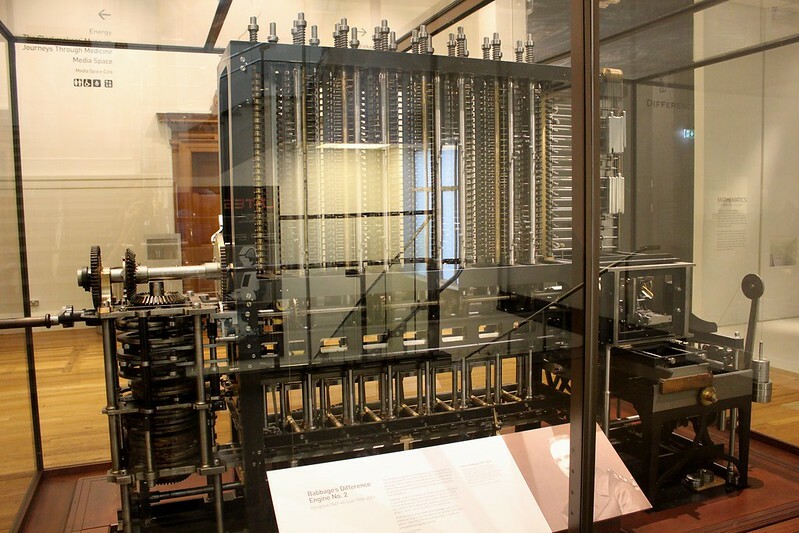 Perhaps it wouldn’t have saved much money to buy Oyster (Sydney is doing so, and it’s costing a similar amount to Myki), but I bet it would have saved time getting it running, and from what I’ve seen, we would have got faster response times on the readers. But of course now Myki has been cut in scope to go no further than the V/Line commuter belt — 13 zones in all. I suspect it could have handled it. 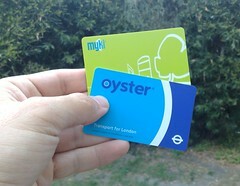 And the rumour is some in the bureaucracy are beginning to realise the way Myki was built was a mistake. Too late now. 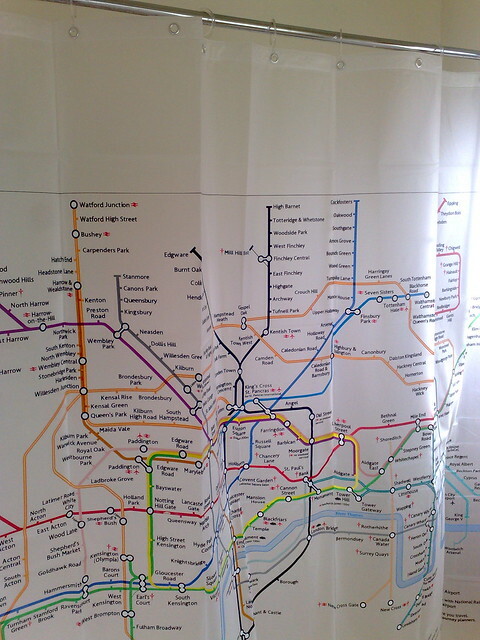 If you’re in London you can get them from the excellent London Transport Museum shop. Otherwise, at the online shop.